The special savings applies to all departures and varies depending on the tour, departure date, and departure city. Our listed prices include the savings and are per person based on double occupancy. 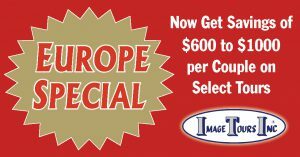 To request a FREE Europe brochure, call your Travel Agent or click HERE. The brochure will include exact dates and prices for each tour from over 100 U.S. departure cities.